In the mobile communications sector software updates for smartphones via WLAN or mobile network are common practice. Now the automotive industry is discovering the benefits of remote updates, too. Today‘s automobiles have an increasing number of electronic control units (ECU), which are interconnected via vehicle net-works (e.g. CAN, MOST). Moreover, software in cars is going to grow in both amount and complexity. That is why it is essential for car manufacturers to manage the software during the entire life cycle of the vehicle efficiently and above all - securely. Here automobile manufacturers are increasingly opting for remote, Over-The-Air (OTA) update technologies. The solution Secure OTA Software Management for Automotive, that combines market-leading software management systems with ESCRYPT’s Key Management Solution Secure Software Updates OTA, provides an end-to-end solution for efficient and secure OTA updating of large and small ECUs, protecting authenticity, integrity and IP of software on head units, telematics, powertrain controllers as well as smaller ECU’s connected and updated via CAN bus. 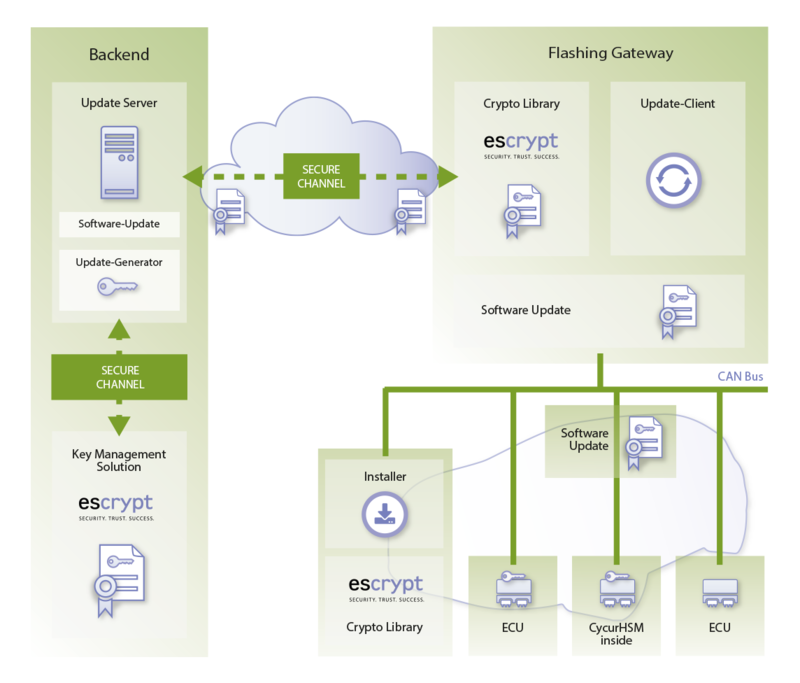 ESCRYPT provides the necessary security components of the turn-key solution. The Key Management Solution Secure Software Updates addresses end-to-end and embedded security, managing all the certificates and keys for ECUs and secure OTA communication, generating signatures before or during upload to software management backend servers and validating authorizations, while complying with the safety rules and policies of the vehicle OEM. To ensure the adoption of OTA management by vehicle manufacturers and drivers alike, a production-grade solution must combine update reliability and efficiency with the strictest safety and security standards. This is exactly what can be expected from the collaboration and combined offering from ESCRYPT, the industry leader for embedded security, specializing in automotive security, and leading providers of SOTA/FOTA management technologies. Our product CycurKEYS is a security software suite that provides and manages cryptographic keys and certificates (symmetric and asymmetric / PKI). Driver infrastructure and application software on the customer side to communicate with CycurKEYS. Our product CycurLIB provides the cryptographic algorithms which are required to authenticate original software. CycurHSM is a complete software stack adapted to the available BOSCH HSM implementations by different silicon manufacturers.